Made with Godminster cheese. Gluten free. Vegetarian. Slices of potato and mature cheddar with rosemary and thyme These potato gratins have been crafted with love, passion and no small amount of rice, creamy godminster cheddar. 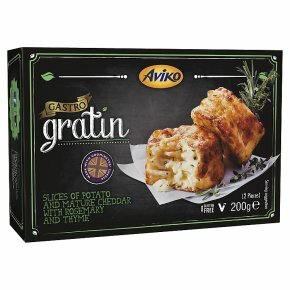 It's the cheese (and a few other clever little flavours) that lend our gratins that bistro-style chef-iness. 3 steps to gratin greatness1. Preheat oven to 220°C/450°F.2. Remove gratins from packaging and place on a baking tray lined with baking paper.3. Cook on middle shelf for approximately 25 minutes until golden and gorgeous.Cook from frozen. Cooking appliances vary. These instructions are guidelines only.